What better way to celebrate summer and the Fourth of July than with your friends and family? 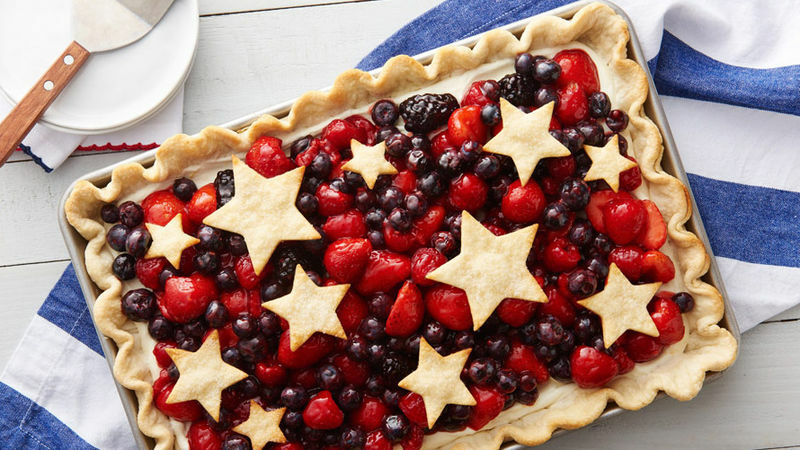 We’ll help get you in the patriotic spirit with red, white and blue desserts, easy-to-make entrées and simply delicious sides. From the main dish to dessert, we’ve handpicked our best meals to help you enjoy the perfect Fourth of July menu whether you’re hosting or attending. And remember, if you’re bringing this dish to an outdoor gathering, always bring your own serving utensils—you don’t want the host to run out! When it comes to outdoor parties, food safety is key. Cold and hot prepared items should only remain in the “danger zone” (40°F-140°F) for up to two hours to prevent any foodborne illness. To help food stay safe longer, keep cold foods on ice and keep hot foods in warming trays (or a slow cooker if possible!). Instead of bringing food to your next Fourth of July party, consider putting together a patriotic craft for the younger kids, like these DIY Confetti Poppers or these fun straw-painted fireworks. Or, buy a few boxes of sparklers for the adults to celebrate too. Plan ahead with the party host and see ask if you can help with any décor: Red, white and blue plastic tablecloths make for great photo backdrops, or bring flag-themed paper plates and napkins for an American tablescape.